Our Cyanide Detectors allow the user to rapidly and easily detect cyanide in drinks and food. Simply place three to five droplets of the prepared sample to the entry port marked on the card and watch for blue color to form if cyanide is present in the sample. Instructions for preparing samples of solid food for testing are included with each purchase. 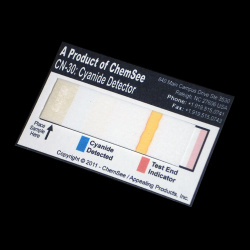 This simple, low-cost test for cyanide is the only cyanide test available on the market that can be used at home and provides instant results. Chop solid foods up into small pieces and mix with an equal portion of water. If the remaining mixture is very thick, add an additional equal portion of water. Mix well for 3 minutes. Liquid samples are used as-is. Add a few drops of your prepared sample into the hole marked “Place Sample Here”. Allow the liquid to travel into and through the detector. Look for a blue/green color to form if Cyanide is present, as seen below.